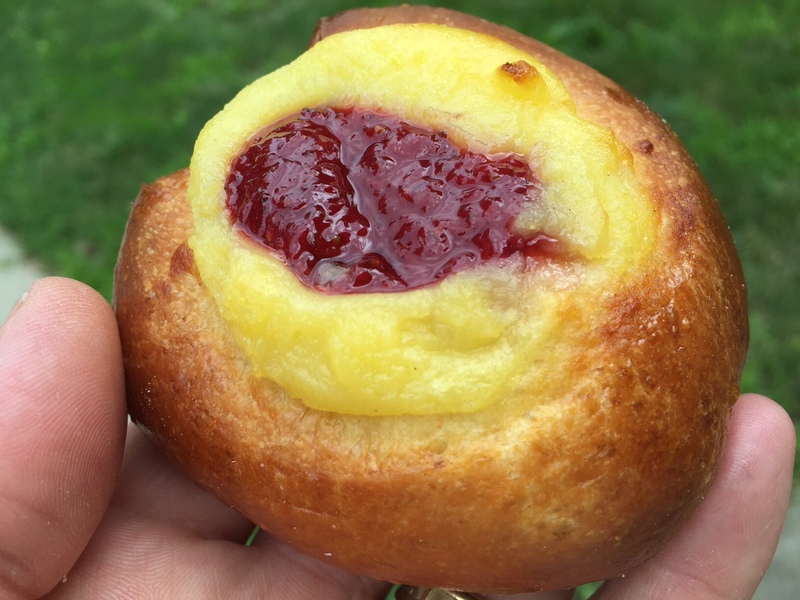 Brioche with strawberry and pastry filling. After selling out my first two weeks at the West Lafayette Farmers Market, I have upped production to the point that I now have a few loaves left at the end of each market day. This is a good thing as I hate to shortchange customers who can’t get to market early or who happen to see us for the first time late in the day. And those loaves left unsold I’ve been able to sell or find uses for afterwards. 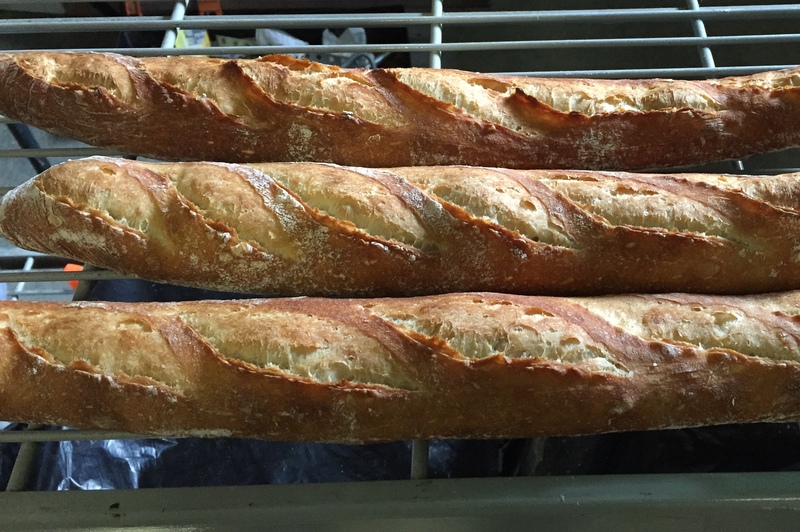 Even though market traffic seems to have slowed the past couple of weeks, I’ve been impressed with the number of returning and new customers who make it to the market and plunk down their cash for something as basic as sourdough bread. And the conversations I’ve had with customers who either want to know more about sourdough or who have sourdough experiences to share have been just as gratifying as the sales. Being a university town (Purdue), West Lafayette sees a steep drop in residents during the summer break between spring and fall semesters, and I have noticed the drop in traffic the past three weeks. In addition, road construction has had a negative impact on market attendance, I think. The nearest major cross street (Cumberland) has been closed to traffic since spring, and construction on two highways outside town has detoured “through” traffic along Salisbury Street where the market is located. Consequently, getting to and from the West Lafayette Farmers Market has been more of a hassle the past few weeks, particularly for older drivers. This past week, as an added incentive, I introduced a couple of new products. One was a sourdough rye made with walnuts and raisins, a recipe I got from Jeffrey Hamelman’s excellent book “Bread: A Baker’s Books of Techniques and Recipes.” I also made a couple of brioche pastries, one of which was brioche au sucre (brioche with sugar) and the other a brioche filled with strawberry and pastry cream. I had only two brioche left at the end of the day and just one rye loaf, so they were a hit. Pain au levain just out of the oven, loaded in the car and headed to market. I also had my first visit by health department inspectors. As a home-based baker, I’m not required to work out of a certified or inspected facility, but I still have to observe the health codes as they apply to retail sales. After they observed my booth and asked a few questions, the inspectors gave me a form that said “No violations at this time.” But I was advised to keep my plastic containers of bread from sitting directly on the ground and to make sure my bread labels include content weights. One interesting side note: I had promised myself that I would make several batches of hot dog buns to sell for July 4, but it wasn’t until I was in the middle of this week’s market that I realized the 4th was already upon us. Oh well, there’s always Labor Day. 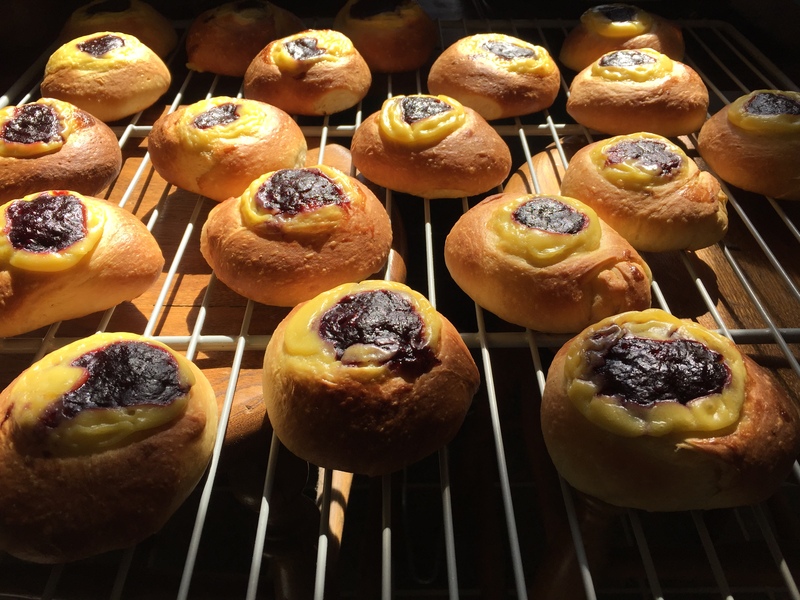 Another aspect of being in a university town is the number of residents who have traveled widely and tasted and experienced “old world” breads. I have talked to half a dozen people who after trying my sourdough ask if I’ve ever been to the Cheese Board Cooperative in Berkeley or tell me I should go there (I’ve been). One customer promised to bring me back some Cheese Board starter next time she goes. I also have several regulars who are of German extraction (or who are from Germany) who feel as though they’ve found a home away from home at Smittybread. I have gotten the same reaction from an Italian who moved to nearby Montgomery County, where he raises vegetables for sale in West Lafayette and at other farmers’ markets. His wife, who makes and sells an excellent lasagne (with bechamel sauce) came by for three brioche pastries. Finally, I recently received an email from a local charity who heard about Smittybread and wants me to make bread for a fundraiser later this year. I look forward to being a part of that worthy cause after the West Lafayette Farmers Markets closes for the season in October! 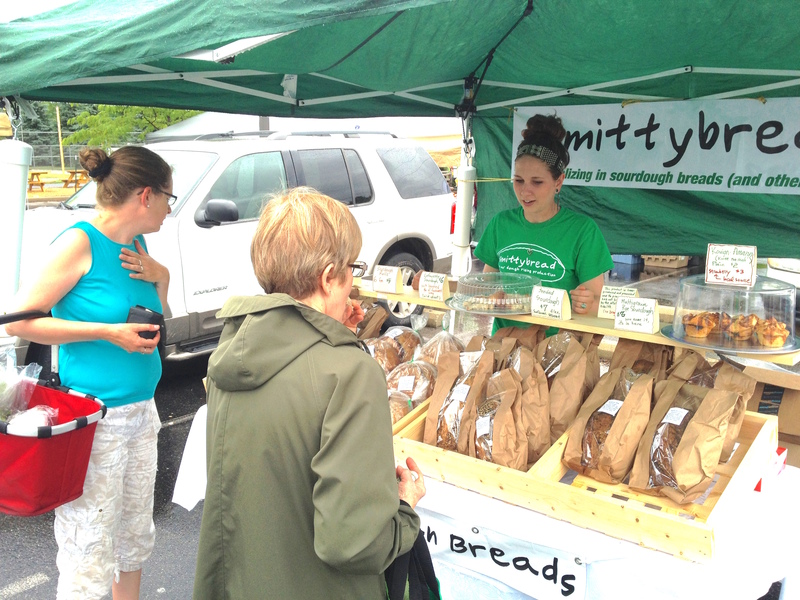 My daughter, Kaytlin Smith, holds down the Smittybread fort while dad takes a break. 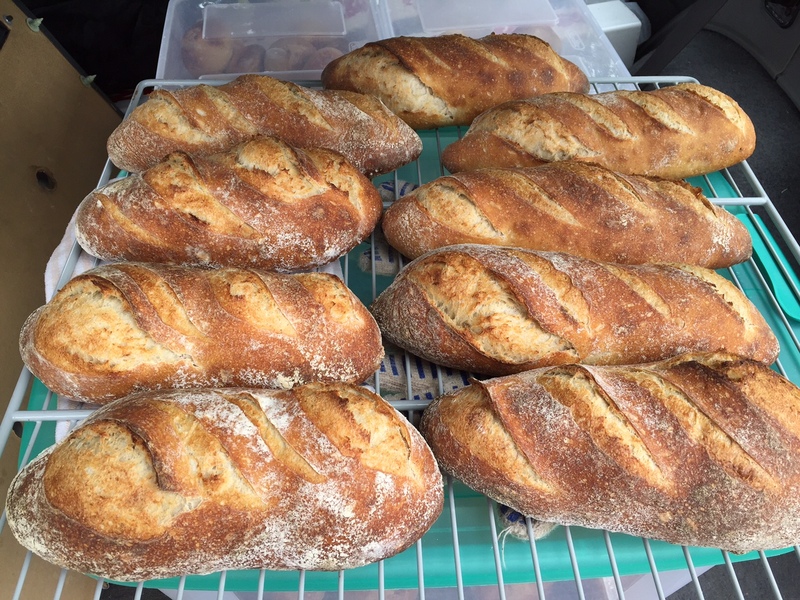 Determined not to get caught short of bread at this week’s West Lafayette Farmers Market, I upped production 20 percent compared with the previous week. As I’d feared, the weather took a turn for the worse, leaving me with gloomy visions of returning home with armloads of unsold bread. Although the forecast had called for scattered thundershowers, it was raining steadily when I got up before dawn, and it rained on and off into the afternoon as great armies of heavy clouds slowly marched overhead looking for farmers markets to pillage. When I arrived at the market site just before 2 p.m., the normally bustling site was mostly empty. Several vendors had cancelled; others must have been watching the skies because they rolled in later than usual. Still, when the opening bell sounded at 3:30 p.m., many of the stalls were empty. Soon after that, the smattering of rain turned into a downpour. This lasted a few minutes, or long enough to fill the popup ceiling with pockets of water before tapering off. Despite the rain, turnout was slow but steady and we were able to keep the bread dry and satisfy several returning customers and a few new ones. During the dry spells we were able to chat with fellow vendors who’d obviously been through such storms and who likewise were grateful that the day was not a washout. While the rain fell several market-goers took shelter under our tent, giving us a chance to captivate them with the wonders of our products. A few bought bread while waiting to move on. Moreover, I learned just how hardy sourdough lovers are. Returning customers came equipped with hats, rain jackets or umbrellas, and shopping bags. 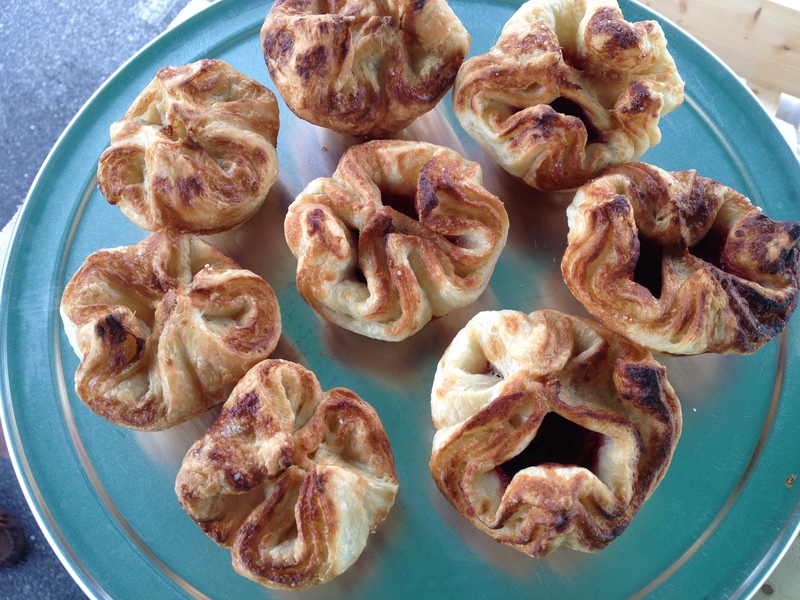 Kouign-Amann, a pastry made of laminated dough similar to a croissant. The ones on the right are filled with a preserve I made of strawberries purchased from fellow vendor, Brubaker Farm. The rain let up about the time my wife, Kathleen, got off work and arrived to help with sales. When the closing bell sounded, we were left with about 15 loaves out of 55. Some of the products were sellouts, giving me a taste of what I could use more of in the future (and what perhaps to cut back.) A surprise best seller were the Kouign-Amann, hand-sized laminated pastries, some of which I filled with a jam made out of farmers’ market strawberries. After unloading our tent and other supplies at home, Kathleen and I went downtown for a bite, taking the leftover bread with us. While downtown we ran into some folks we knew and sold a few more loaves. We also sent out messages on social media to anyone interested in buying. By the following afternoon most of the unsold bread was gone, although at discounted prices. 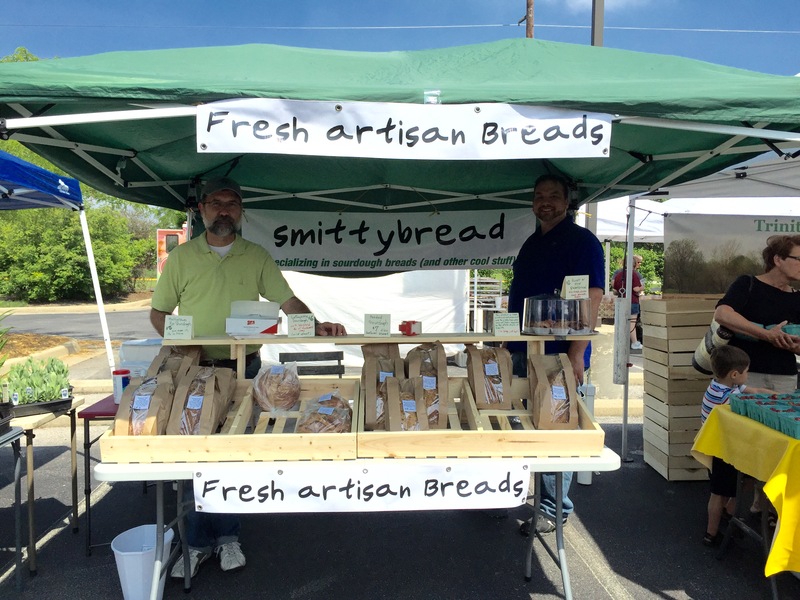 All in all it was a good market and a learning experience for Smittybread. OK, maybe selling out my first week wasn’t a fluke. 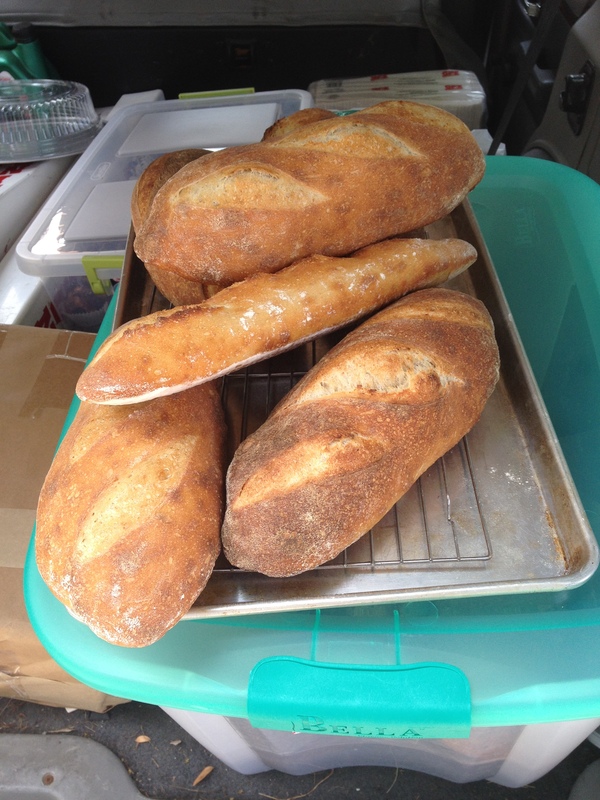 This week at the West Lafayette Farmers Market I came prepared with 45 loaves of four different sourdough breads, plus five bags of rolls (1 lb. 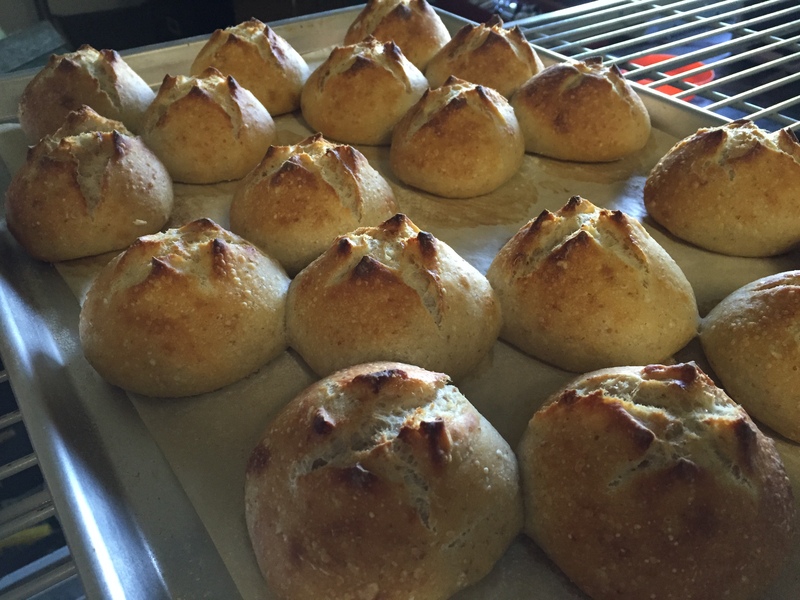 per 6 rolls) and a couple dozen “pocketbreads,” which are sourdough rolls with goodies inside. That compares with 32 loaves and no rolls last week. In other words, I boosted my production more than 50 percent. Still, all the bread and all but a few pocket rolls were gone within two hours of the 3:30 p.m. opening. Whew! I didn’t expect a super high turnout because it was hotter than hades Wednesday afternoon (in the low 90s in the shade, if you could find any!). And with 15 additional loaves, I thought surely I’d have a few to sell after 5:30 p.m. But the rush began even before the 3:30 p.m. opening. One of the early customers included someone associated with the market who saw what happened the previous week and wanted to make sure to get hers before they were all gone! Luckily I received able assistance from my good friend and artist LaDonna Vohar. She helped set up the booth and sell bread during the great rush. 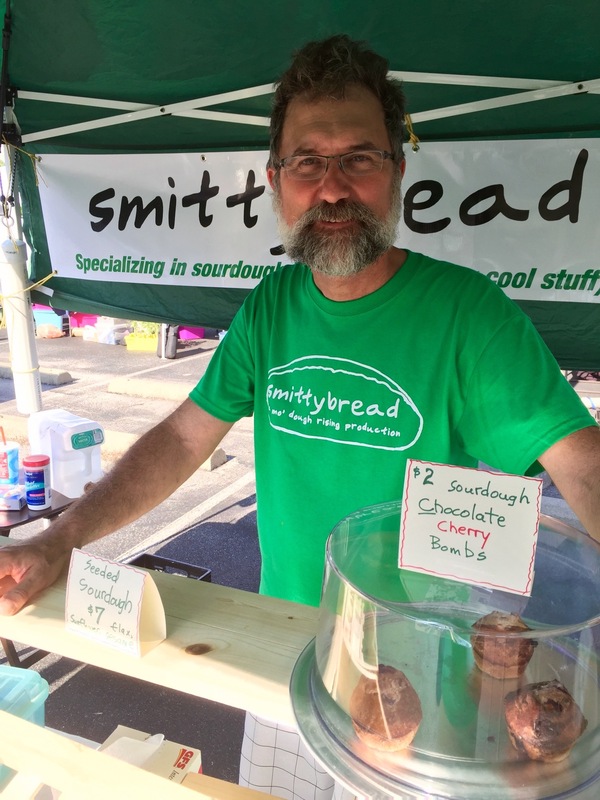 By the time my wife, Kathleen, arrived from work the bread was gone and we just stood there in our new Smittybread T-shirts watching the dwindling number of marketgoers and wondering when to pack up and leave. Not that I’m complaining, but it makes for a long afternoon when no one stops to buy bread or talk about bread for the final hour and a half. 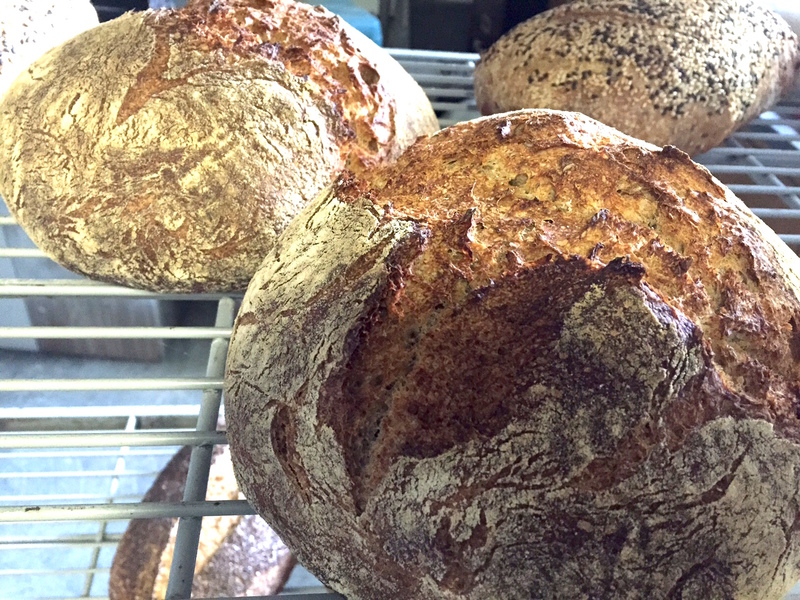 Half the fun is explaining the differences between the various breads, answering any questions customers might have about the product, and talking shop with customers who are into baking or who are familiar with sourdough. Several friends have asked how difficult it will be to increase production. I tell them that if I had a bread oven, cranking up production would be no problem. 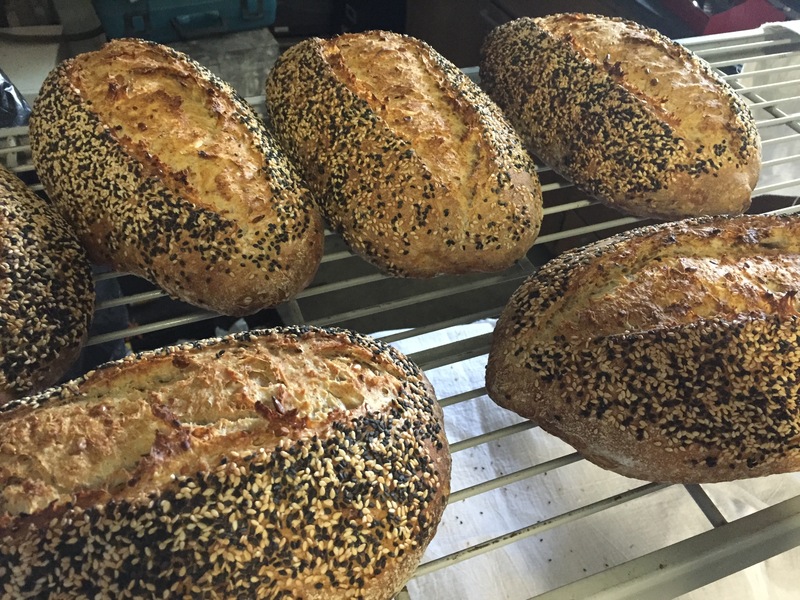 Even a small hearth oven (with or without steam injection) could handle a minimum of 16 loaves per bake. But cranking them out five or six loaves per hour using a kitchen range oven and a small commercial convection oven is time consuming, difficult work. The baking is definitely the bottleneck, but on the plus side I am getting very familiar with the slight differences in volume, shape, and texture that occur when loaves are baked too soon, too late or just at the right time. I am also learning how to schedule production so that when the ovens are warming up to 475 F I’m being productive; when the loaves are baking, I’m measuring and mixing or shaping, etc. 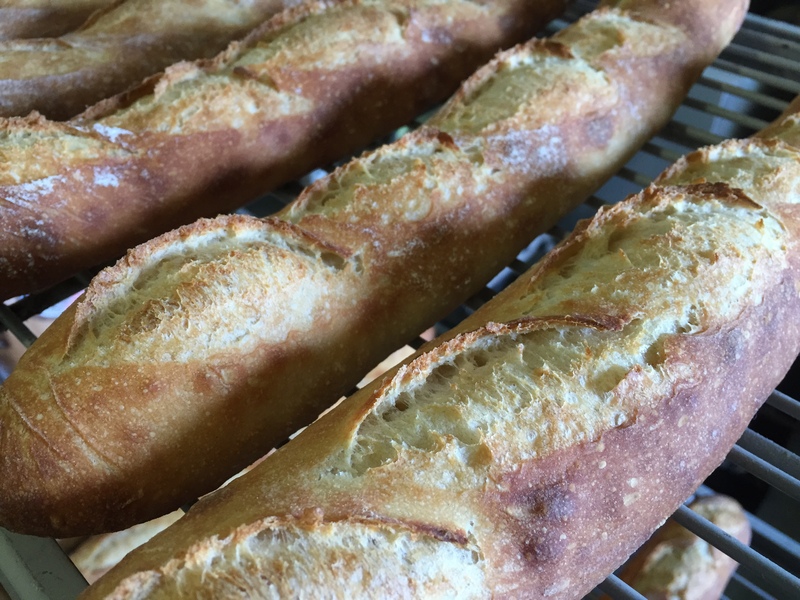 In fact, my goal in selling at the farmers market is working toward the bigger goal of learning what customers want and how to produce it consistently so that someday I can open my own bakery. This week I plan on adding an external temperature-controlled relay to a two-door refrigerator so that it consistently stays at 50 degrees, which is an optimum temperature for overnight retardation of sourdoughs. Assuming that task succeeds, I’ll be able to boost production without increasing my lead time before sale. I think another 12 or 15 loaves should do the trick. We’ll see next week! My first day at the West Lafayette Farmers Market was busy, rewarding and exhausting. The short version of the story is, we sold out of bread in about two hours. Luckily we still had some samples and business cards to share with customers who showed up after the hearty loaves were gone. And I walked away with renewed confidence in my baking skills and knowledge of what to do differently next time to become more efficient and make more customers happy. Selling out is a gratifying but slightly embarrassing thing. I’m sure there were some who wondered why we would show up with not enough product to sell. 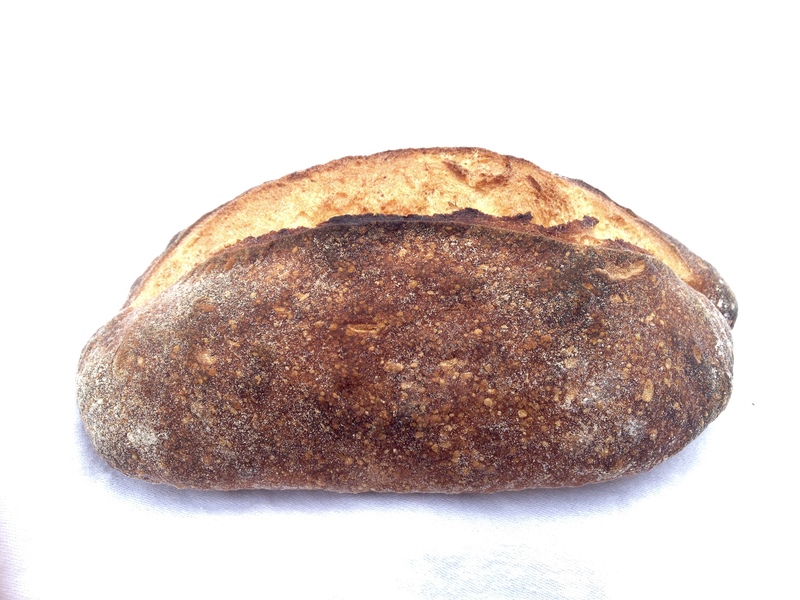 Truth is, I wasn’t sure we would find as many customers for hearth-style sourdough breads as we did. I’ve been sharing and sometimes selling breads to enthusiastic family and friends for the past several months, but the general public? I had a notion we would sell some bread but hardly expected the enthusiastic response we received. The 32 loaves and 24 “pocketbreads” I brought to market were gone before I had a chance to take a decent picture! First, I have to thank all my family and friends who helped me the past few weeks get everything ready to go, especially my wife, Kathleen, who has been my constant companion and moral and financial support as I pursue this passion. Also thanks to her son, Josh, for helping set up my first booth and for being a super salesman. To LaDonna, for making graphics, sewing bread basket liners and procuring business cards at the last moment. To Johnny, for logistical support (a Hobart mixer ain’t light!). And to Fergus, Bev, Gretel, Tom, Mary, Dave, TJ, Jennifer, Chris, Brent, Chuck, Richard, Kurt and many others whose appreciation for hearth breads (mine in particular) has kept me going. See you at next week’s market!